Please read shop policies for postage stuff etc. All patterns by me unless otherwise stated, thanks for stopping by. Beautiful set! Looks AMAZING on camera! Thank you very much! Moshi-moshi Blythe outifts are made by me, Hilary, on my sewing machine with hand sewn detailing. I use carefully sourced vintage fabric, japanese fabric, Liberty cotton fabrics and American cotton prints to make the clothes. 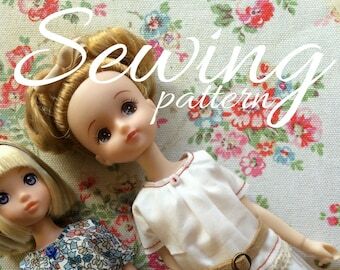 I like to use small prints, that have a tiny appeal, but because I love fabric in general I am always experimenting with different designs - to see what suits Blythes best. 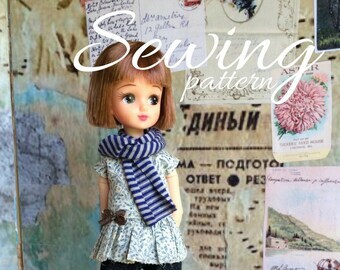 I mostly use my own patterns for Moshi-moshi clothes, and where I have used another pattern this is credited in the item listing. Photos are of my own Blythe Dolls, and these are not for sale. I am sorry that I cannot offer refunds or replacements for items lost or damaged in the post that have not been insured. However if you'd like to insure your package, please purchase a priority mail listing which is avaiable in the shop, or upgrade your postage option. I post orders out once but occasionally twice a week depending on volume, but all orders are usually posted within 7 working days. If the shop is busy there is sometimes a delay. Please allow up to 14 days for overseas orders and maybe longer, some postal times vary considerably in different regions. Shipping outside the UK may be longer, due to customs and different countries postal systems. If you would like faster shipping, please contact me, and I will arrange priority mail at an additional cost. Listings are for items described, only. Fabric patterns may vary, slightly from the photograph, as many items are made to order.